I'm not Martin Luther but last night I had a dream. This dream was incredibly real and specific. In the early morning hours, I had a dream about today's trading. In the dream, I knew for certain that today would be a long day. I also dreamed that we would take out yesterday's lows and bounce up from there during inventory and the inventory would cause a parabolic spike up. Oddly enough, the picture in my mind of the way the chart looked after the stop run at the bottom looked like YESTERDAYS price action. Of course the inventory spike lower did not happen. But the parabolic spike up did. There was a spike lower that took out the current day low. I did not recognize this as what happened in the dream and therefore I did not trade it long. In fact, I was short prior to the spike lower which ended in BE. Before you start thinking I am losing my mind, I did not trade or attempt to trade based on this dream. I'm just reporting what happened and making and observation about it. Was there a trading opportunity based on this dream? 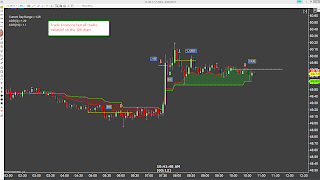 Yes there was but even if I recognized the little spike lower as the one in the dream, I would not have traded it. That is completely outside the rational mind and any reason to take a trade. I just find it interesting that perhaps the subconscious might actually play a role in our day to day activities to the point of attempting to forecast the future. On the other hand, it could be that I knew it was inventory day and my brain has seen so many of these stop run whipsaw events that it projected one into the future. Not a bad bet actually. It didn't happen today but it sure could have. 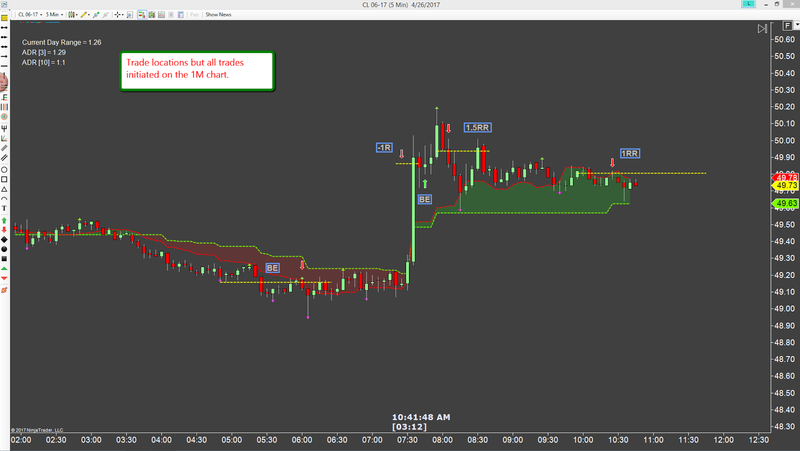 I traded primarily off the one minute chart today based on 15M and 5M directional charts. It was a bit choppy but I ended up +1.5RR by fading the spike up. I did this twice after an earlier failed short. The two successful shorts made up the loss and gave me enough for a small profit. I would have liked to be in the parabolic spike up but there was no way to get in prior to the number without taking significant risk and no way to get in after without the same issue. So just have to let it go. Today represents a new equity high for me. It feels good and I think I shall celebrate with a coffee!